Militant ambivalence? 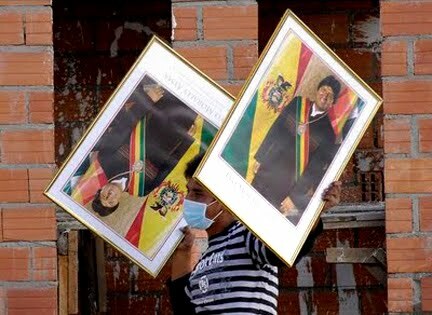 A demonstrator holds portraits of President Evo Morales during a protest in La Paz, Bolivia. Photo from Reuters. COCHABAMBA, Bolivia — A poster of “Guernica” was bursting from the wall, and the umpteenth Latin American rendition of “My Way” was booming from the record player. I was sharing a hand-carved table in a Cochabamba cantina with a cowboy from the Chapare, an anti-capitalist immigration officer, an anarchist surgeon, and a barbacoa-restaurateur. All had been supporters of President Evo Morales’ Movimiento al Socialismo (MAS). 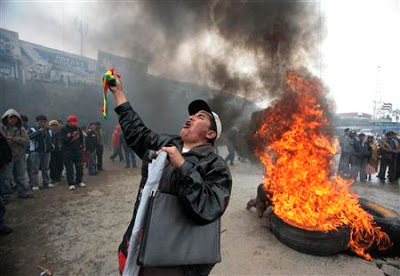 The conversation was fiery and, as is normal here in the Andes, its topic was politics. Despite this particular crowd’s claim to the middle class, the agreement among them echoed a truth of Bolivian culture: a tendency to view things from the perspective of the collective, rather than solely from one’s perceived interests. And indeed, this conversation echoed other charlas I’d had with campesinos, taxi-trufi drivers, and union members — and I need to be straight with you: things are not going well for the government of Bolivia’s first indigenous leader in 500 years. It was only a matter of filling in the details — and, in between gulps of Auténtico beer and Cuban mixed drinks, said details were pouring forth at the cantina. Then the question was put to me. What did citizens of the United States think? I had to admit two answers: 1) if my daily dip into The New York Times provides any indication, people in the U.S. are basically uninformed about goings-on in Bolivia; and 2) for U.S. leftists, environmentalists, and climate-change activists, the aura of hope unleashed by the 2005 election of Evo Morales lingers like perfume from a Cochabamba jasmine bush. 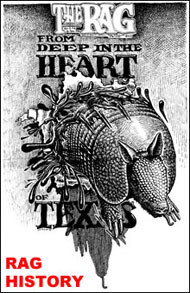 I offer, then, a sweep of an overview of what’s happening and what some cowboys and campesinos, taxi drivers, and rank-and-file, are thinking. 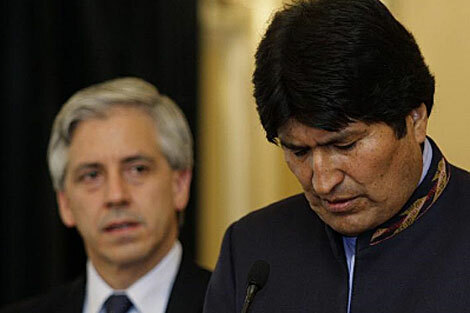 Bolivian President Evo Morales reacts during a nationwide message at the presidential palace in La Paz while vice president Alvaro Garcia Linera looks on. Photo by Reuters. Out of one tine of what has become the Morales administration’s two-sided tongue come blood-stirring proclamations like the president’s empassioned grito “¡Planeta o Muerte!” at the 2010 Cancun climate change talks. Brilliant. Then there is the stark refusal, that not even Cuba or Venezuela would match, to sign on to the watered-down agreement at said talks. And now comes the nation’s new law proclaiming the rights of Madre Tierra — to some minds, a legal-philosophic leap forward that, a few decades ago, only bioregionalists, primitive-anarchists, and traditional Native peoples could imagine. an explosion of airport and high-rise construction. In other words: full-tilt, high-tech, colossal-scale, high-capital modernization — on a Madre Tierra in which such expansion has already been shown to be The Problem. 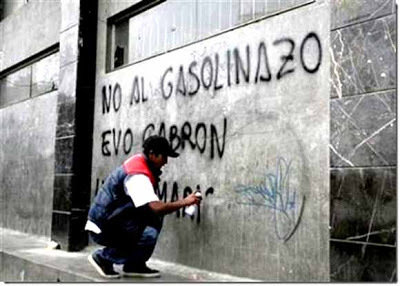 A Dec. 30, 2010 protest against gas prices turns violent. Top image from FM Center es Noticia. Below, from Reuters. Regarding governance, from one side of Bolivia’s forked tongue is spoken the legal language of plurinationalismo. After centuries of dictatorships, neoliberal governments, and military juntas, the 2009 Morales-initiated Constitution legitimizes a form of decentralized federalism: a reinstatement of decision-making to local communities, whether defined by place, indigenous heritage, or worker identity. 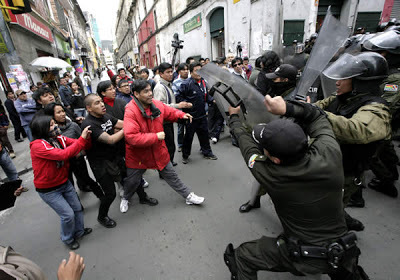 But the truth remains: ever since the immediate threat from the right wing subsided following Morales’ 2009 re-election by 62%, a chronic refusal to listen to the very social movements the president promised to follow has posed a disturbing blow to adherents of participatory democracy. 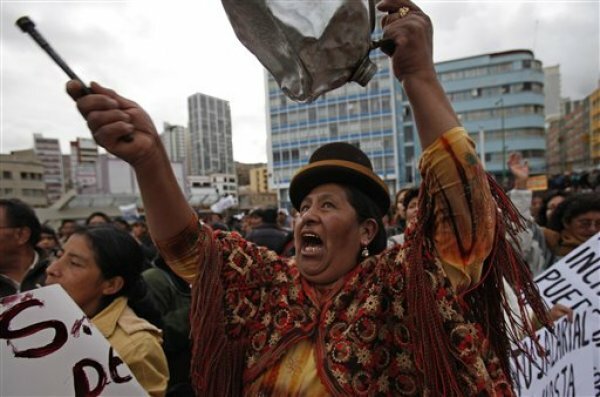 Indigenous woman in La Paz protests against high prices and low wages on Feb. 25, 2011. Photo by Juan Karita / AP / La Prensa. 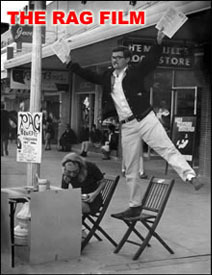 When indigenous groups protest the bulldozing of their lands for the construction of freeways; when state workers call for increases in salaries against the reality of galloping food prices; when media workers fight for freedom of the press against regulations threatening fines and license suspensions, state control of 20% of the media, and state ownership of all of it — the administration’s reaction is knee-jerk. Whether by the vice president or the president himself, citizens questioning the government’s dictates are received with neither concern for their suffering nor gratitude for their participation; they are bold-facedly dismissed as instruments of U.S. imperialism, middle-class whiners, out of touch, and/or dupes of the right wing. 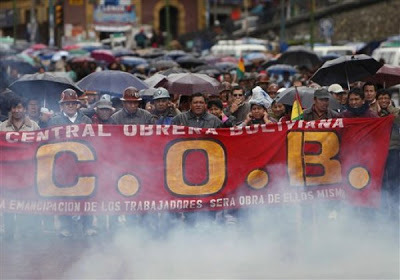 The Who’s famed rock ‘n roll declaration, “Meet the New Boss, Same as the Old Boss,” comes to mind, and the long-standing trade union congress Centro Obrera Boliviana (COB) is now seeking to unseat the vice president for just such a pronouncement aimed at workers. A demonstrator sprays graffiti protesting fuel price hikes in Bolivia. Photo from Reuters. At the same time, Bolivia is rife with chronic problems that, according to some street-level opinion, the government has failed to address. Corruption within government is an age-old theme. During the Morales administration, the most spectacular example occurred in February 2011: the U.S.-Chile-aided arrest of the national jefe of police, former head of the Fuerza Especial de Lucha Contra el Narcotráfico, and founder of the Centro de Inteligencia y Generación de Información, General René Sarabria Oropeza — caught in the act of opening up cocaine routes to Miami. 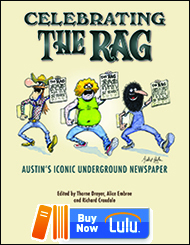 His accomplices included a mayor, a military colonel, and a captain. Another revelation of corruption, more so perhaps for spiritual interest, was the June 2010 arrest of Valentín Mejillones, the amauta-priest who had led the purification ritual of Evo Morales’ inauguration at Tiawanaku in 2006 — for hosting a cocaine purification factory in his El Alto home. According to Diego Rada Cuadros, a lawyer whose family was forced to flee the country during the 1980s dictatorships, in the nation-state boasting the severest poverty in South America and — save Haiti — all of Latin America, a position in government that may last but six years (or, most probably, less) is a one-shot chance to amass some longer-lasting plata. Too, while Bolivian coca has been sold for cocaine manufacture since Vietnam War days, the country is fast becoming a global fount of cocaine — and this development also feeds popular discontent. In the tropical Chapare, where the leaf used for cocaine is grown, every family has a tale of relinquishing food crops to grow the more valuable produce, giving up agriculture all together to work in a lab, or loaning out a youth to play lookout at a staggeringly high salary of $200 a month. According to satellite surveillance reported by the United Nations Office on Drugs and Crime and U.S. Drug Enforcement Administration (DEA), since Morales launched his presidency, the number of hectares commandeered has expanded by fútbol fields: by 2008 as many as 28,000 hectares were ponying up some 130 tons of cocaine, and in 2010 the vice president divulged that el narcotráfico now contributes $700 million a year to the national economy. To boot, one out of every 20 workers in the country is engaged in the biz. In truth, the location of drug production is most often determined by international events like droughts, floods, inroads made by drug-war efforts, and inter-cartel politics — yet many Bolivians contend that Morales is to blame. In 2008 he threw out the DEA; all the while, they contend, he was ignoring the expansion of cocaine production as he blithely touted the sacredness of the coca leaf and pushed for the right of cocaleros to plant it. La Central Obrera Boliviana (COB) represents approximately 2 million workers and indigenous activists. Photo from AP /La Prensa. Curiously, in Spanish, the word for “disappointment” is decepción — a term that, to the English-speaking ear, does not merely name a feeling; it proposes a dynamic between inner and outer by citing the presence of an impacting source. In Bolivia popular decepción was measured in a Radio Fides poll in February 2011. The sample was conducted in the barrios of La Paz that are normally a MAS stronghold, and yet a whopping 84% of respondents reported loss of confidence in the government of Evo Morales, with 80% saying they’d go for a change. In other words, the red-blue-white chompa-sweaters emulating the one Morales wore on his 2005 foreign-policy tour — that every Tomás, Ricardo, and Hari was sporting in 2006 — are now totally and completely… out. 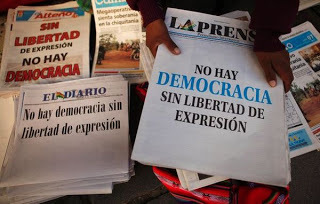 Also reflecting growing disappointment is the fact that today’s Bolivia exists in a near-constant state of disruption due to non-stop huelga-strikes, paro-stoppages, bloqueo-road blocks, and manifestacion-demonstrations. Such extreme tactics were honed during the military dictatorships of the 1960-‘90s to force demands by taking the economy hostage — but they fell off during the early, hope-for-the-best years of the Morales administration. As I pen this essay, the post office is closed down and a road block has halted overland travel between Cochabamba and Santa Cruz. Before that, in April, COB threw nationwide marches and paros seeking increases in state medical worker, teacher, and retired incomes to keep up with inflation. From December 2010 through March of 2010, during the worst global-warming-induced storms — when for months rain gushed as if being thrown from a bucket and floods washed over communities like raging rivers — the taxi, trufi, and bus choferes and transportistas shut down what was left of the water-logged economy with paros, bloqueos, and manifestaciones in all the major cities of the country. Earlier, in October 2010, when the government began to whittle away at guarantees for freedom of the press via La Ley Anti-Racismo y Toda Forma de Discriminación — ostensibly geared to fight racism and sexism, but also containing two articles initiating government control over content — the nation’s periodistas hit the streets with coffins bearing microphones and reporter tablets, wrote protest placards with their own blood, hung like Christ figures from the balconies of buildings, collected thousands of signatures, and appealed to international press associations. And in July and August of 2010, the city of Potosí – normally a MAS bastion — presented Morales with demands to be included in the promised proceso de cambio-process of change, mounting hunger strikes, bloqueos, and mobilizations of up to 100,000 protestors. 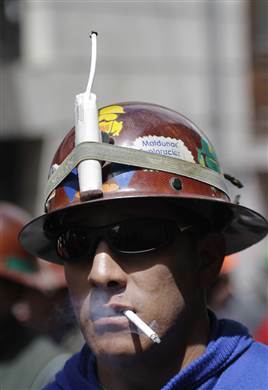 A Bolivian mine worker with a stick of dynamite on his helmet joins thousands of Bolivian miners in a protest rally in La Paz on April 6, 2011. Photo from Reuters. I understand that the information I am laying out may be difficult to take in — and please know that activists in Bolivia have asked me to tell their compañeros in the U.S. what is happening here. In a world laden with fires, tornadoes, hurricanes, tsunamis, volcanoes, earthquakes, and technological disasters; unending wars over land, oil, and water; the unfolding of Peak Oil and, frankly, of what scholar Richard Heinberg calls Peak Everything; a refurbishing of nuclear technologies and fears of nuclear war; swathes of electromagnetic radiation from consumer and military installations; increasing corporate power; decreasing social liberties; out-of-hand control by drug cartels; cancer epidemics; mass addictions; and growing social chaos — in this world, hope is a precious thing. When my essay “The Techno-Fantasies of Evo Morales” came out in CounterPunch (December 24-26, 2010), the messenger was held guilty by a few — to me, revealing the distress at losing, or at least calling into question, the pure promise that Evo Morales’ Bolivia had once offered. Such distress is not unknown to me. I left an established life in the U.S. to be part of history in Bolivia, and when I arrived in April 2010, my heart clawed at my throat upon encountering the cynicism and despair that had replaced 2006’s enthusiasm. But now, if I may muster an iota of the courageous perspective my friend, the injured professor, has managed: the predicament isn’t isolated. It shows how bad things are — for all of us. Indeed, the politics of the socio-techno-psycho-economic aggregate known as empire have had their way. As American scholar Arab Edward Said has noted, no one in this world has escaped the impacts of imperialist conquest. And yet, if we acknowledge that a better — and perhaps evolutionally built-in way of being human — is possible, we might also grasp that the conflicts, contradictions, and conundrum created through centuries of ripping people from roots in land and community, whether by force or seduction, have us by toe, throat, and tail. Yes, ours is a world writhing in the clutches of “Guernica,” in which too many are dancing to the individualism of “My Way.” In such a world, how does the beautiful, spirited human being blossom out of the militaristic politics, oversize scale, sterile alienation, and brash egoism that have, in one way or another, infected every one of us and every institution in our midst — including in a mountain land called Bolivia? I don’t ask my question seeking The Answer — for, after a lifetime of participation in the political, cultural, and psychological movements of our times, I am aware of the multitude of intelligent projects afoot. I ask my question rather that — if only for a moment — we may bring awareness and compassion to the sad reality of our world. This entry was posted in Rag Bloggers and tagged Bolivia, Chellis Glendinning, Evo Morales, South America. Bookmark the permalink. This is a fantastic article,very well informed, reeking of intellectual honesty. I love the writing, too. 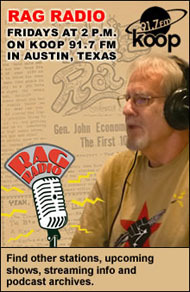 Many thanks to Chellis and thanks to Rag Blog for publishing it. My cousin once again has brought an issue, that many in other parts of our world would probably ignore. Chellis as eloquently as usual cuts through the political spins in order to let us see the real issues, and ones slanted to endorse one point of view over another. Great job Chellis , you make a cousin proud !